Have leftover seasoned chicken and don’t know what to do with it? Why, make chicken and dumplings of course. This post is part of a three-part post connected to my Soggy Chicken recipe. In that post, I cooked a whole seasoned chicken and used over half of it for two additional meals. This is one of the meals I used the chicken for and the other meal is the Chicken Biscuits. I do love chicken and dumplings, and we can’t talk about chicken and dumplings unless I talk about the very first time I took the man to eat BBQ. You may have read this story before, and if so, just skip to the recipe, but for the new comers, you are in for a treat! I have a funny story to share about chicken and dumplings. Paul, my husband, is originally from Michigan. Poor thing, he didn’t know about the goodness of southern foods. I, who had never spent much time across the Mason Dixon line before we met, didn’t know that people up north didn’t know about soul food. I thought everyone ate like we did. We are a fried, butter loading, cheese using, bacon grease using, Lawry’s seasoning, calorie filled, generational recipe using bunch. I took him out to lunch with my best friend, Alicia, at the best BBQ place in town. For those of you not from the south- BBQ in the south is pulled pork. It’s a noun and not a verb 🙂 It was a buffet style restaurant. We arrive and I grab my plate, Alicia gets hers and Paul gets his. Alicia and I are off. We start loading up on all the goodness that the buffet has to offer: fat back, fried okra, bbq, chicken bog, sweet potato casserole, collards, squash casserole, biscuits, you know.. all the good stuff. After stacking our plates full of the good stuff, we get our sweet tea (because that is all you drink in the south) and sit down. Paul is still in line. Finally he starts walking very slowly to the table. I check out what’s on his plate. I look at him like it must be a joke and burst into laughter. He sits down with us. Alicia see’s why I am laughing and she joins in. We are the only one’s laughing. Paul is just sitting there with a bewildered look on his face. Realizing something is wrong, I stop. I said, “Hon, why did you put chicken and dumplings on top of your rice?” I will never forget it… he looked like a kid… he says as honestly as he could, “I have no idea what this stuff is! I have no idea what any of that stuff is up there. You just left me in line and I don’t know what I am eating.” I am laughing as I type this, remembering that moment. I eventually took him back up there and explained what it all was. He is now very skilled in soul food- he can even cook it! I trained him well. He can eat collards and black-eyed peas with the best of them. I will forever have that memory attached to chicken and dumplings and we will carry it with us through old age laughing about that day every time we sit down to eat Chicken and Dumplings. This is my recipe. I have modified how I use to make it so that it is more like what I grew up eating. You can make this over the stove in a hurry or throw it together in your slow cooker. The batch that I made this week I threw over the stove about 20 minutes before we were supposed to eat because my chicken was already cooked. If you have frozen chicken, then just throw everything in the slow cooker except your crescent rolls and half and half. About 15 minutes before you are ready to eat add those to your slow cooker. I will be writing the recipe below from the perspective of stove top cooking and already cooked chicken. In a stock pot add all of your ingredients except your crescent rolls and Half and Half. Bring to a simmer. Pinch off pieces of your crescent rolls and add them to your pot. I use about a half of can. What you don’t use just make into rolls. Once those fluff up a little, give your pot a gentle stir. Let it continue to simmer slowly until the dough is no longer expanding and looks like it’s as fluffy as it’s going to get. This takes about 15 minutes. At this point add your Half and Half. I added a good splash. If I had to guess I would say I add about 1/2 cup to the batch. Stir gently to incorporate throughout your dish. Season with salt and pepper and serve. We had this the other night and the man walked through the door and saw what was in the bowl and asked where the rice was. It’s always good to laugh at yourself once in a while! 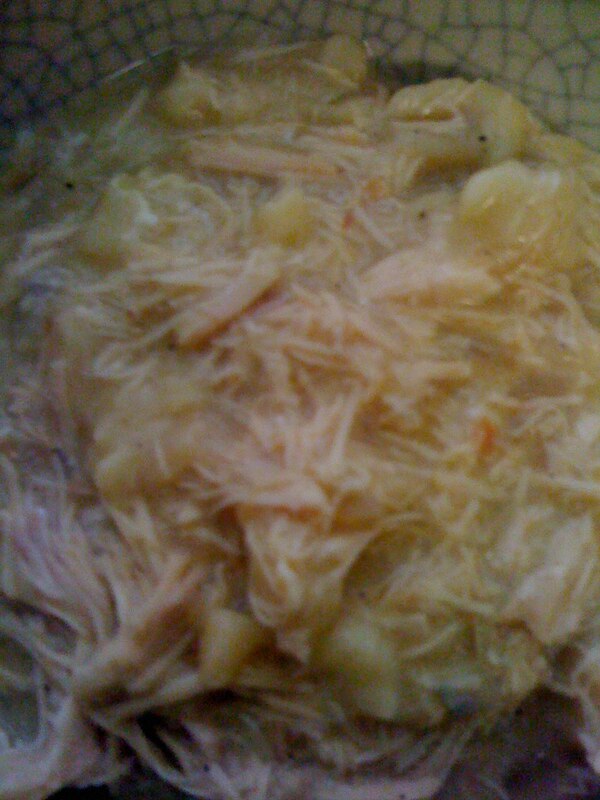 Last night we had Crock pot Chicken and Dumplings. I have wanted to try this recipe for a while, but never got around to it. It was easy, budget friendly and wait for it… good. I have been eating chicken and dumplings since I was a kid. I have tried a few of these recipes before and didn’t really like them. Paula Deen has one for drop dumplings that I wasn’t a fan of. This one turned out pretty good. I used skinless, boneless chicken breasts. I also used diced onions and didn’t remove them as the recipe said. It was so good that we ate everything in the whole crock pot! There were no leftovers to be had. 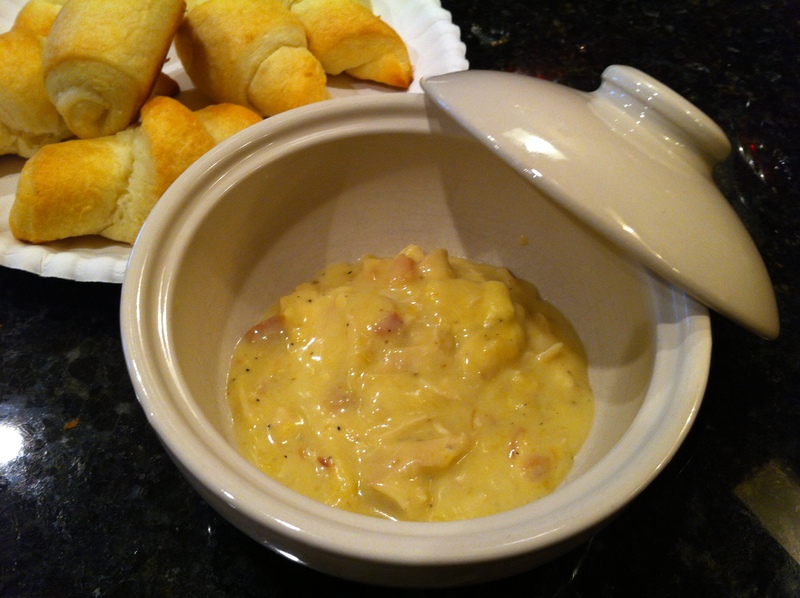 I have a funny story to share about chicken and dumplings. So, Paul, my husband, is originally from Michigan. Poor thing, he didn’t know about the goodness of southern foods. I, who had never spent much time across the Mason Dixon line before we met, didn’t know that people up north didn’t know about soul food. I thought everyone ate like we did. We are a fried, butter loading, cheese using, bacon grease using, lawrys seasoning, calorie filled, generational recipe using bunch. I took him out to lunch with my best friend, Alicia, at the best BBQ place in town. For those of you not from the south- BBQ in the south is pulled pork. It was a buffet. We arrive and I grab my plate, Alicia gets hers and Paul gets his. Alicia and I are off. We start loading up on all the goodness that the buffet has to offer: fat back, fried okra, bbq, chicken bog, sweet potato casserole, collards, squash casserole, biscuits, you know.. all the good stuff. After stacking our plates full of the good stuff, we get our sweet tea (because that is all you drink in the south) and sit down. Paul is still in line. Finally he starts walking very slowly to the table. I check out what’s on his plate. I look at him like it must be a joke and bust out laughing. He sits down with us. Alicia see’s why I am laughing and she joins in. We are the only one’s laughing. Paul is just sitting there with a bewildered look on his face. I stop- realizing something is wrong. I said, “Hon, why did you put chicken and dumplings on top of your rice?” I will never forget it… he looked like a kid… he says as honestly as he could, “I have no idea what this stuff is! I have no idea what any of that stuff is up there. You just left me in line and I don’t know what I am eating.” I am laughing as I type this, remembering that moment. I eventually took him back up there and explained what it all was. He is now very skilled in soul food- he can even cook it 🙂 I trained him well. He can even eat collards and black eyed peas with the best of them. Anyway, I thought I would share that story. I will forever have that memory attached to chicken and dumplings.